Today, I decided to take Oz with me to Gogo's swim therapy. He paced aorund the edge of the pool the whole time. Then at one point, he got crowded by dogs and decided to jump on in. Boy was that a mistake. He splashed around in a panic and tried to climb out the wrong end. He soon realized that he was trapped and couldn't get out. The therapist and I eventually led him over to the edge with the steps and he made it out. He kept trying to shake water out of his ears and sneezed for about 10 minutes. David was taking a nap this weekend. 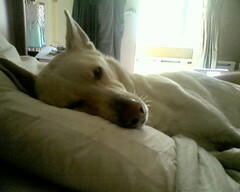 He looked over at my side of the bed and Oz was in my exact position - head on the pillow, stretched out on the bed. He was being David's "Keith Substitute". So he took a picture with his cell phone.